Sara Morgan is one of those Brits on pole you don’t hear quite as much about – but whose contribution to her racing series is every bit as important as the people who appear on the podium. 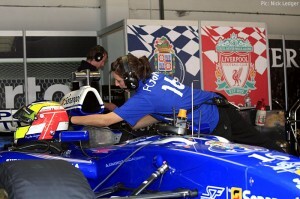 Sara works as Chief Mechanic for one of the drivers running for Buckingham-based Hitech Racing’s race-winning FC Porto team in Superleague Formula. The team also runs the Liverpool FC and FC Midtjylland cars, races in Britsh F3 and was formerly involved in GP2 through an association with Piquet Sport. She’s the only woman in Superleague doing this job – and considerably further afield too. Sara works with French driver Tristan Gommendy and her role includes preparing the car before races and being on the pitwall in the thick of the action. She said: “I have been involved at race meetings for some years and so I’m used to being the only woman in the pit lane. I really enjoy what I do and I don’t have any kind of problems with it. He admitted, however, that he was a little thrown off balance the first time the pair met: “The first time I got in the car and Sara started to help me fasten my safety belts the situation was a little awkward! “As professional as she is, the first step was to pull the part of the belt situated between my legs! She stopped for a few seconds and looked at me and I think she was wondering whether to ask if it was OK.
Categorised under Careers, Superleague Formula, tagged under Hitech Racing, Superleague Formula, Tristan Gommendy.